A reputable witness: "We were over at my mother-in-law's in Mt. Carmel, and that's about 11 miles from Princeton where I live, and it was evening and there was a storm coming up and we got upset over there. We had some bad experiences. A tree blew down and we decided to leave. We stopped at a filling station and got some gas and then we proceeded on to Princeton through the (Wabash River) bottoms and a, (of) course this was the time about when they were building PSI (the Public Service Indiana power plant) on the right hand side of the road. "And we saw what appeared (now it was dark) to be a couple of headlites. Well, we assumed they were maybe a temperature inversion, but then we got to thinking that during a thunderstorm or rainstorm you're not going to have a temperature inversion, it's going to be kinda stirred up. But directly in line with this was Owensville Rd. We thought maybe they might be headlites bouncing off of low clouds. These (lights) were up in the air. "Our angle of perspective changed as we approached it. So we found out it was above the trees. The lightning caught up with us about this time and a pretty-good-sized bolt was behind it and we got it illuminated all around us and we saw what we appeared to be a saucer. Kinda weird, but the whole family witnessed it and nothing was said until we got home. "What surprised me, of course, we thought it was a car because it was the same spectral response that you'd have (received) from headlights, you know, the infra-red region, HEAVY in the infra-red. As we got closer to it, before the lightning struck, we saw what looked like clearance lights, one on each side of it. Later on it proved to be four, of whatever the light was, dotted around the cupola. And beneath it was a super-dark cone which apexed below the tree level. And this thing (the cone) didn't appear to be solid, the cone that came down to the ground or whatever it went down to. It was sort of wide at the bottom of the saucer and evidently went to a point which would have been the opposite of a flashlight beam. And, ah, we kinda got a shock over it. "I'd done a little snooping around during some rainstorms seeing if we could see it again, my oldest boy and I, back in where we thought it was in the woods. "As you come outside of Mt. Carmel and are proceeding towards Princeton, you'll find a large woods with a bunch of little spots where they've cut out to plant popcorn, I think, and corn. And it was over one of these patches, in fact it was the exact location where this Cavanaugh girl was found. "There is one thing. We've discussed this, the family and my oldest boy (he's 15 now), this is a good topic for us, inter-family. Ah, if these were lights shining on out, I would think they were more outside, than in, because if there were anyone inside this thing they would have been almost blind because the lights, if these were portholes, I'm saying, they would have to be almost blind because the lights were almost the same illumination as car headlights, although we didn't see any beams shooting out from them as you would on a car. "But the cone beneath it seemed to be, well, what I'd seen in laser, except on a much grander scale, in a different light spectrum. Of course in a storm you'll have heavy in ultra-violet, and ah, which could have made a red appear black, or any color would be off-color. Maybe there is something here in a beam, you know, like a laser. I think they (U.S. scientists) are doing experiments with green lasers that actually support objects. Why not? "Another little injection here. It looked archaic, something out of Jules Verne, like a pickled metal, you know what I mean? When a piece of metal is heat-treated, pickled, a burnished silver color? It looked like this, well, you'd almost say you saw the rivets on the damned thing. Of course I didn't see any rivets. It was old-fashioned looking, not streamlined, (but) straight up and down, the cupola, with a little rolled edge on it. And ah, nothing ultra-modern that you would associate with space travel or something like this. I don't really believe the damned thing came from outer space (laughing). I mean, it doesn't ah, seem... "Usually there is an explanation, but this damned thing, there wasn't any explanation for me (laughing again), you know, it was there, solid. "The damned thing was sitting awfully still, to be...it moved in from the west, or let's see, east, and then kinda stopped and started down. And so smooth and determined in its movements. It wasn't being affected by the storm any. "I'd say about 30' above the tree-level, five, six-hundred feet away, I'd imagine. I would estimate it about 30-40' (wide). Of course, I'm not very good on judging distances or sizes of objects. I overestimated (driving) because I thought it was landing or going down into a field which was just on the other side of the woods is an open field. So, I speeded up and went up there, and it had went down into the woods. So I had overshot my estimate there. We slowed down and watched it to almost a stop, I'd say three or four minutes. All the time we had good lighting from the lightning. Of course, I'd say it was ultra-violet, and this does make the colors...screws up the colors. It changes the shades heavy ultra-violet. "The object was on a NW to SE track, descending." Weather was stormy, sky overcast with thick clouds, light rain, and lightning. Temperature was warm. The strong wind was from the west. The initial observation was of headlights, low on the horizon, to an object at about 30-degree elevation. The car was a 1971 Chevrolet 4-door Impala, air conditioning was on, windows closed "until I purposely rolled them down to observe. Realizing at this time it was a UFO, I turned on the radio, but did not hear any interference, nor did the engine stall, as I have read they did. 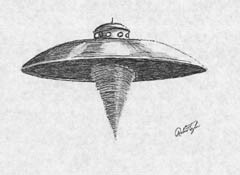 At about 1,000' from the object, it stopped its linear movement and hovered, until we were within 500', then it descended very slowly into the woods."